"You Are Not Alone: Taking Advantage of Networking"
We would like to thank all of you who attended this year's Annual Training Seminar in Charlottetown, PE! We are happy to announce that we had great attendance with over 230 delegates and 200 exhibitors in 88 booths. Please join us again next year in Moncton, NB! Many Thanks to all who attended! We would like to thank all those who attended this year's seminar in Saint John, NB. We would like to thank all those who attended this year's seminar in Charlottetown, PE. We hope to see you all again next year in Saint John, NB. It was a great year with 68 tradeshow booths, 249 full delegates, 12 companions, and 5 day passes! We would like to thank all those who attended this year's seminar in Halifax, NS. We hope to see you all again next year. Make plans now to join us next year in Charlottetown, PE. Click HERE to download the official 2015 Annual Seminar Invite brochure (PDF Format). With the theme "Riding the Tide - Keeping up with Technology" and workshops on controls, upgrades and alternative technologies and the very popular Equipment and Supply show, this year's Seminar was as exciting and informative as ever. 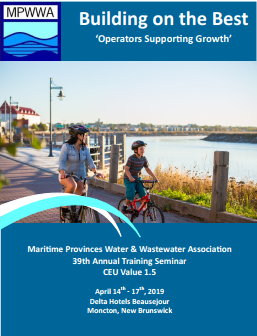 The 32nd Annual MPWWA Seminar was held at the Delta Prince Edward in Charlottetown, Prince Edward Island from April 22nd to April 25th, 2012. The chosen theme " The Earth is our Island - How we protect it" resonated throught the many very well attended training sessions. The 31st Annual MPWWA Seminar was held in Halifax at the Westin Hotel April 17-20, 2011. Over 250 delegates plus companions attended with most of the sessions standing room only.